Today is Boxing Day in pretty much all countries that were once, or still are, part of the British Empire. In Portugal, nobody has faintest idea what Boxing Day is, mind you in Canada, many don't really know what the day is all about either. Apparently there are two stories that somewhat serve to explain how Boxing Day came about. First, back in feudal England, it was common for the lord of the manor to provide his servants with a gift the day after Christmas, a gift that was, of course, given in a box. The second story, also dating back to the same era in British history, relates to servants being allowed to take home a portion of the food leftover from the Christmas celebrations in a box to their families, this in conjuction with the distribution of alms from the church collection boxes to poor parishioners. Of course today, the term Boxing Day makes very little sense. If anything, in todays day in age, the name can be best applied to us boxing up unwanted Christmas gifts and returning them. Boxing Day, however, very much like Christmas in general, is a day that's become wrapped up with the culture of consumerism where 'mad prices' are abandant, where everything is 20, 40, 50, 70 per cent off, and where all stock must go - it's the Boxing Day sales! Images such as these have become synonymous with this day. 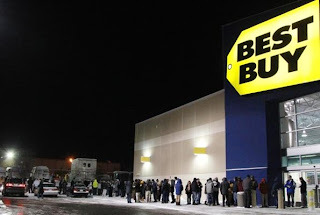 People lining up at dawn in the freezing cold outside of a Best Buy waiting to get a deal on the latest technological gadget. Once the doors are open, it's the mad, crazy rush to be the first to get their hands on what they've come for, or to buy as many as they can, or to get their hands on the limited stock of merchandise, or perhaps a combination of any of these. 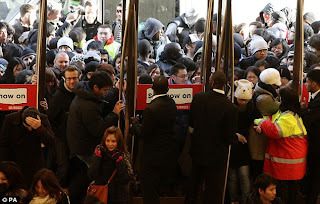 With this tradition having become what it is, many stores have even gone on to apply special opening hours on this day. Now although Boxing Day is a Canadian federal holiday, it is not uniformly observed in all provinces and territories. It is not an official holiday in Quebec, for example, nor is it a statutory holiday in Alberta and British Columbia. As well, in some provinces, namely the Maritime provinces, stores are not open on Boxing Day which means that all Boxing Day sales actually start on December 27th. Ok, sofar I've made it sound like Boxing Day in Canada is all about people getting their greedy hands on products made available at incredible discount prices all in the name of satifying their needs for pleasure and consumerism. Yes it may be true, but Boxing Day also goes beyond that. Also synonymous with Boxing Day in the Northlands is ice hockey (we are after all talking about Canada) as every year, on the 26th of December, Canadians gather around their newly purchaced 64 inch televisions to watch the kick off of the IIHF World Junior Hockey Championships. Very much ingrained as a holiday tradition for millions of Canadians, the World Juniors brings together leftover turkey, qualify family time and the red and white of Canada, all in the name of cheering on the Canadian kids in a tournament they are expected to win every years. In the picture below, Portuguese descendant John Tavares celebrates after helping win gold for Canada in 2009, something he had done the year before as well. Here in Portugal we have no Boxing Day, we have no mad rush to buy the latest cheap products (especially this year) and we don't have a major hockey tournament the whole country can rally around. As Boxing Day is non-existent here, this day is simply the day after Christmas Day. Still, it was good to see Canada beat Finland 8-1 in their opener today. It's great that some Canadian Boxing Day traditions can follow us around even when we're far away. Thanks internet!